There is a downside of having watched too many movies (and most of them being critically acclaimed ones), it's gets more and more difficult to find a movie that's truly refreshing and impressive. Even the critically acclaimed ones fail to extract "wow" from you. However, after watching the Spanish director Julio Médem's 1998-movie "Lovers of the Arctic Circle", I realized it not that difficult for an inventive director to generate that "wow" feeling even from the movie-maniacs like me and what's more? He has done it making a romantic movie. Romantic movies in my view are the most risky venture for a movie director seeking to make a great movie because usually there is a very thin line between a great romantic movie and a cheap chick flick. 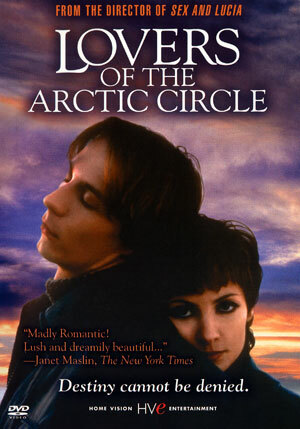 Full of themes of life, death, love, destiny and more prominently the circle of life and its coincidences, Lovers of the Arctic Circle tells the story of Otto and Ana who first meet when they are kids outside their school, are fascinated by each other and later on develop an incestuous relationship as half brother and half sister after Otto's father falls in love with Ana's mother and they get married. Their names are palindromes, a fact highlighted time and again in the movie, to symbolize the circle of life, I believe. 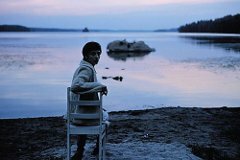 The film traces Otto's and Ana's story from that fateful day outside the school to a day in their 20s where they meet once again in Lapland within the Arctic Circle, under the midnight sun. As teenagers Otto and Ana become secret lovers as they live in the same house and are siblings. They get separated when Otto's mother dies while living alone and Otto blames himself and his father for the miserable way his mother died. He leaves Ana and becomes a airplane pilot. Though their paths cross again and again throughout their lives, they keep missing each other until the power of their love finally draws them together. The plot demands your full attention to be understood (if you are used to linear plots, you are going to have a hard time) and the cinematography gears towards a visual poetry. Circles in incidences and events as well as coincidences are abound. The scene where two lovers sitting unaware of each other in a cafe and moving along on another path for a while exemplifies the missed chances in life and how much life depends on fate. Even the coincidence that the first meeting of Otto and Ana was substantial in bringing together their single parents and making them siblings is an example of irony of life. The way story unfolds is arguably more interesting than the story itself. The story is expressed through Otto's and Anna's perspectives one after another. Viewers can feel assured that they will be kept engaged until the end. However, the ending is very likely to polarize them. Some will hate it whereas some will find it poetic and the right one. I felt like being kicked on the stomach but again thought it was the right one. I was happy to find this amazing movie that impressed me with its inventiveness and stroke of brilliance. Highly recommended!